On Wednesday, November 2nd, Oakland will be in the state of a General Strike. Called for by Occupy Oakland after the overwhelming and violent police action to enforce the 10pm-6am curfew at the plaza where protesters were camping out, this will be the first general strike in the United States in sixty-five years. Frank Ogawa Plaza, named for the Japanese-American who was interned during WWII for over three years and later served 28 years on Oakland City Council in the 60’s- renamed Oscar Grant Plaza by Occupy Oakland, will be the crossroads for a multitude of marches from striking students to workers to children. From 2-5pm there will be a food justice teach-in at the plaza, 14th Street and Broadway, Downtown Oakland. Shortly after the general strike was ratified, we began sending out feelers to other seed libraries, gardeners and folks that resonate with social change through the plant world for a teach-in, reminiscent of actions I have read about during the Vietnam War protests. Turns out we were not the only ones feeling the need for positive change. 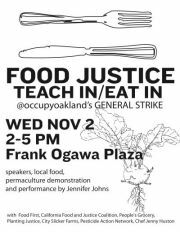 A consortium of food justice organizations, authors, and activists organized a teach-in/eat-in for November 2nd at the Oakland General Strike. The Seed Library will give a practical hands-on intro to seed saving along with a demo on making seed balls with edible plants. We go on at 3:45pm at the Food Justice tent/table in the north end of the plaza.